(first posted 2/10/2013) In the good old days, Cadillac was always about superlatives, most of all when it came to size. They just kept getting bigger and bigger and bigger…until the laws of nature finally interceded, and they imploded. Not totally unlike the life cycle of stars; before they collapse into a black hole, they swell into red giants. So here is the Red Giant of automobiles; the biggest regular production car ever: 250 inches (6.35 meters). Strictly speaking, the 1974 version was two inches longer, but you get the point; and this is what I found. Anyway, it’s a bit dangerous to hang around red giants just before the implode; they create a supernova. And that can be quite deadly. In discussing the Cadillac Fleetwood 75, it’s important to note that this was a regular production model, and not a “stretch limo”. There were two versions: the Nine Passenger Sedan, and the Limousine, which had a glass divider. Imperial had some spectacular Ghia-built limos for a few years, and Lincoln toyed with them too, but both were built by outside coach-builders, which made them substantially more expensive than the Fleetwood 75s. Cadillac practically had the limo market sewn up for itself for decades. They weren’t all that expensive: $12,000 ($60k adjusted) would put you in the back seat of one in 1973 (chauffeur not included). And Cadillac sold around 1500-2000 every year, like clockwork. “Stretch limos” as we know them now mostly didn’t exist back then. 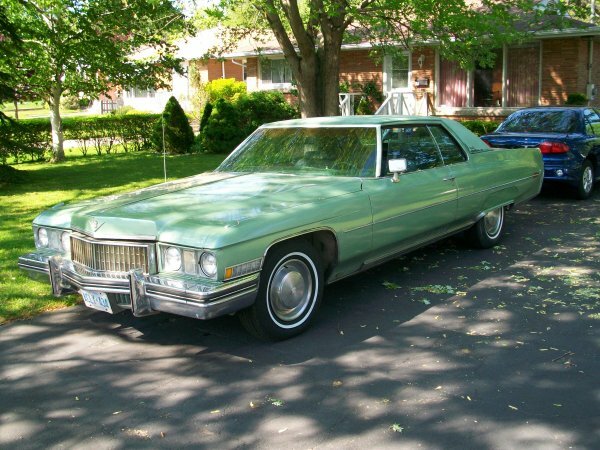 They started to come along right about the time Cadillac downsized the first time in 1977 (above). The eighties were all about flash and bling, and the downsized 75 was looking rather modest. Cutting and stretching a regular Cadillac sedan became a growing undertaking, and not just for the undertakers, but also for the coke-takers. 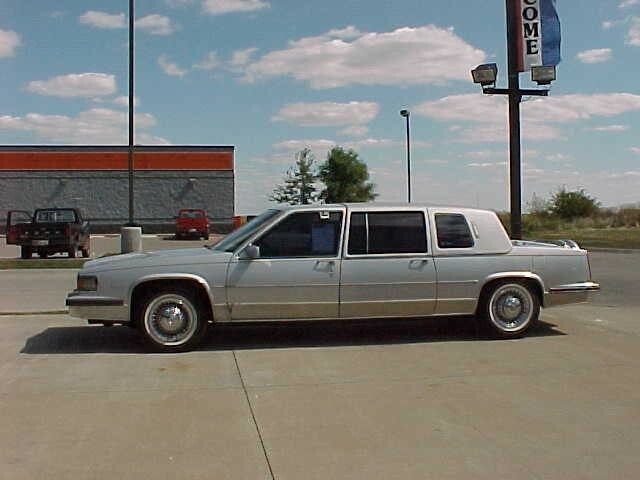 But the final implosion to Cadillac’s limo business came in 1985, with the drastically shrunken FWD models. The timing couldn’t have been worse; and coach-built stretch big Lincolns sopped up the market, as well as stretched Cadillac RWD Broughams. This was the black hole, even in silver. Cadillac managed to sell a couple of hundred per year, until they pulled the plug in 1987. The ignominious end of the long road for Fleetwood 75s. The only thing that could make these look long was the even shorter K-car Chrysler Executive Limo. This one sports a tv antenna; I’m not sure if it dates back to 1973, although small Sony tvs were becoming quite common. I remember riding in a stretch Cadillac in the Bay Area, accompanying a beautiful Venezuelan novela star on some promotional appearances, and we were trying to watch our station in the back; not exactly a successful undertaking. Looked impressive, at the time. That’s more than I can say about the back seat of this one. Maybe this was used by the Rolling Stones in 1973, and never again. No way to tell whether it had Medici, Magi, or the old-school cloth. This is the corded cloth, for “the conservative buyer”. 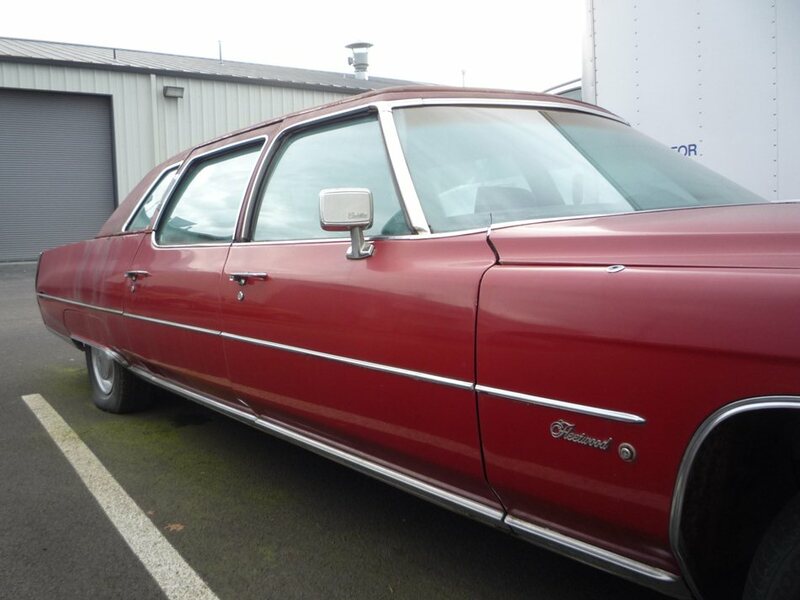 For the more adventurous or flamboyant, the Medici option is shown here, in a Fleetwood Brougham. And to keep from Carmine having to dig into his files of every Cadillac fabric ever made, here’s the Magi, the third option for the 75. It’s described as a “lustrous matelasse”. Good luck finding a source for that now. Fabric stores always made me feel a bit woozy, though. I need some fresh air…and some steel and cast iron. And there’s plenty of that under the 75’s long hood: 472 cubic inches (7.7 liters) of air are encased in the eight cast iron cylinders (not at any given moment, though). They churn out 220 (net) hp, and 365 ft lbs of torque at 2400 rpm. That’s a fair amount of twist, but a wee bit disappointing, given all those cubic inches. By 1976, the 500 inch motor would be standard, but torque dropped even further, to 360 ft. lbs. They have some 5800 lbs to push. Not enough? Throw a turbo (or two) on it. Padded vinyl has a limited lifespan, and this one is actually better than some I’ve seen of this vintage. And water has been collecting at the bottom of the rear window, also a common malady. So who exactly would order a red Fleetwood 75? Don’t ask…it was 1973. I’m thinking this would make a good addition to the Official CC Tours fleet, for the Broughams of Eugene Tour (30 minutes max). Just need to put in an order for some replacement Medic fabric. or shall it be Magi? You tell me; otherwise I’ll just go grab a few saddle blanket-print pickup seat covers from WalMart. Did anyone notice that it is longer than the box truck next to it? In the US or entire world? I live in Sweden and I reckon its about how you sell it. Id die for it ;). five feet shorter and almost a foot narrower. though. smh…. Gotta make it Boomer-friendly! The current CTS is actually only half an inch taller (57.2″ vs. 56.8″), 55 inches shorter (195.5″ vs. 250″) on a 36-inch shorter wheelbase, and seven and a half inches narrower (72.2″ vs. 79.8″). Yes, the bodies were built low, but they still sat up on a frame like a truck. Ah, a proper limousine, one with the rear doors in the right place for access to both the rear bench and the forward-facing jump seats. When these were new I admired the ingenuity with which Cadillac combined parts from the two door coupes and the four door sedan to produce the limo version: just add a bit of minor tin-bashing (rear doors, roof) to the recipe, and voila! Actually thats what they did for the 1977 and up cars, the limos up until 1976 had a full custom body with huge rear doors that cut into the roof while the front doors were regular Fleetwood sedan doors, the Fleetwood limos were built in the Fleetwood Fisher Plant 21 building on their own special assemby line, they actually still involved some hand assembly. I would say that the true limo has to have that sheltered back seat. More like a coupe backseat, the rear passengers aren’t visible to the rabble until they step out of the car through that huge rear door. 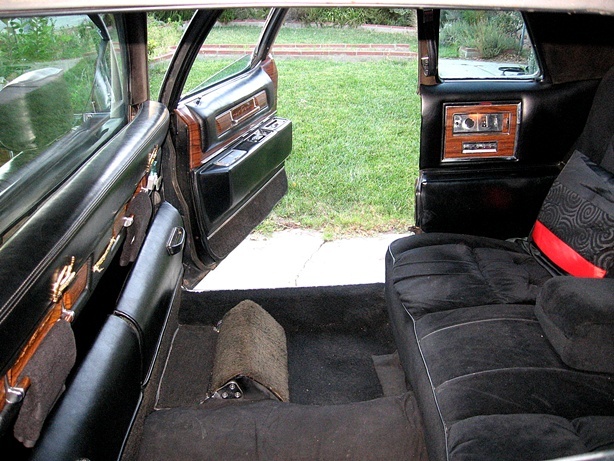 Most limo conversions just have a back door like any sedan. Stretch limos are an abomination in my eyes. used for bachelorette parties, high school proms, bachelor parties and the like. Totally out of proportion and out of good taste. Having a personal driver for your Town Car would be much classier. Agree 110%. Stretch limos look horrible. The Cadillac 75 modern day successor is probably the new Maybach S Class – remarkably similar in that it is an extended, not stretched, version of the s class done at the factory. Mercedes actually have a long history of in-house limousines and they still do them with or without armour. Thankfully though they don’t do one with Medici fabric. That poor woman in the 75 – she looks like she is being held in place by Velcro. You said it, Jose. I totally agree. Some good scenes of one of these are in the TV show Banacek, staring George Peppard. Same model year, in black with a radio telephone. I owned one of these in mint condition back in the late 80’s and early 90’s – a copper / gold ’74 Fleetwood Seventy-Five nine-passenger sedan (no glass division). 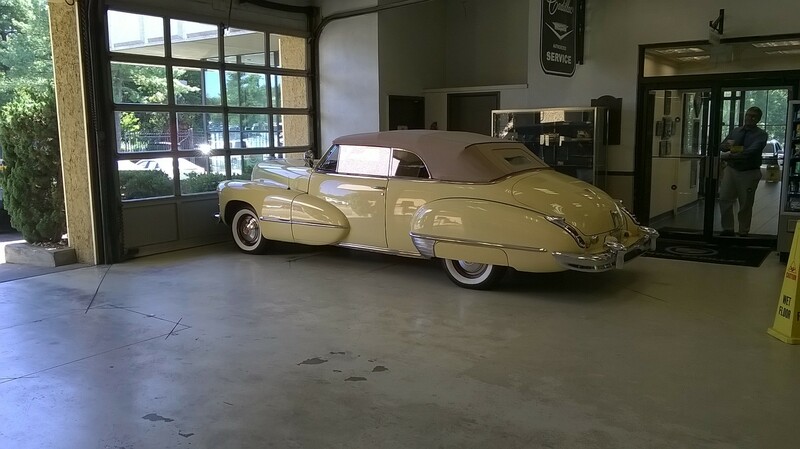 It was a fantastic car….truly the epitome of what Cadillac really should be all about. There always seemed to be numerous occasions where it would be filled to it’s 9-seater capacity to haul people whether it was going out to lunch or doing a Sunday brunch run. It was definitely the party car…people always felt special riding in it. Incomparable! My God, did this car ever put the U in Ugly. Broughamalicious Broughamalac Brougham! If I owned this monster, I’d park it in one of those “compact car” parking spaces in the parking garage where I work (if I could make it past the first corner). Too big. Never was really into limos. I’ve only ridden in a couple, for funerals. My goal is to stay out of the custom professional car for as long as possible. Not looking forward to the one way trip. What is also interesting is how these were manufactured. GM had a special factory was staffed by the most talented and senior craftsmen. During most of the year the factory acted as a developmental assembly line (for all body on frame and rear wheel drive cars) where assembly procedures for new models were developed before production of the new models began at the assembly plants. But for a few months out of the year, I think in the fall, the plant made the Caddy limos. Some parts like the front clip, drive trains, front doors, dashboard, and rear clips were production, but most of the body and the interiors were custom made by the craftsmen. Being that it was a developmental assembly line, the cars were almost pushed from station to station when each phase was complete, and each car was built to order. This plant stayed open till some time in the 80s when GM decided to change over to unit body cars and no longer needed this plant. So since the developmental assembly line was no longer there, GM also went out of the limo business and gave it to the custom car companies (that had been building some Cadillac and other make limos, as well as hearses all along). 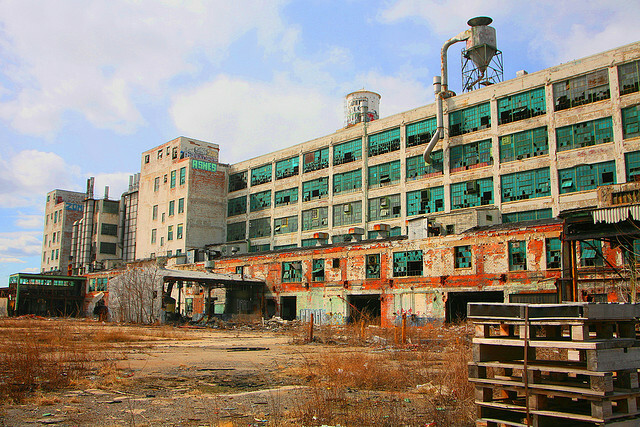 That was the Fischer Body Plant #21 in Detroit, a couple miles from my house. It still stands, though it has been long abandoned. I went in there a few years ago to look around and take some pictures. I was in grad school for photography at the time and thought about doing an installation with an actual Fleetwood 75. In the end the idea was entirely too cliche, I just wanted an excuse to buy a 75! Here’s a picture of the plant (not mine). 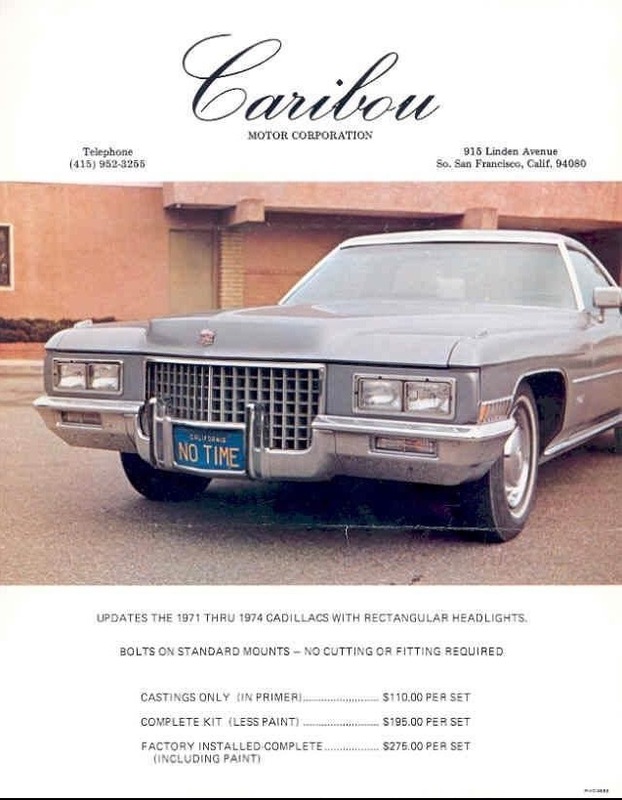 Didn’t Cadillac’s limo business in the early seventies have something to do with Delorean’s ouster from GM? Something to do with Delorean having an über-expensive custom limo built for himself? It was that, plus some scheme with a compnay in which he had a financial interest that developed an 8-track-like video player for Chevrolet showrooms. I have never heard of any of that. I always believed that DeLorean left GM just because he wanted to do his own thing. He was head of Chevrolet and VP of Production for all of GM at the time. People thought he was next in line to lead GM after Ed Cole retired. He probably could have given his talents. He is gone now, but I probably would have sold my right arm to sit down and talk with him about the car business for a day. It’s from one of the books written after Delorean’s epic fall from grace after he was arrested and his company failed. Supposedly, Ed Cole was interviewed after he retired and flatly stated that if Delorean hadn’t quit, he would have been fired for the above transgressions. The general theme in those books is that Delorean was promoted to the 14th floor so it would be easier to fire him. The 14th floor executives didn’t much like Delorean and, whether it was warranted or not, they were more than happy to see him go. Given the apparent shady way Delorean managed his company and the characters he hired (one of his main people was a guy named Roy Nesseth, a car salesman that evidently makes William H. Macy from Fargo look like a saint), and his life after the arrest, it’s not hard to believe. Actually the drive train and sub chassis are not stock Cadillac at all. I’ve owned a few 75s the drive line is commercial with a carrier bearing, the rear end and the transmission are all commercial, (hence commercial chassis listing for parts for these vehicles). Same with the 75 sedan, hearse and ambulance. the frame suspension, brakes and all sub components are commercial. These cars are factory but are truely custom in every sense when it comes to standard Cadillacs. That is really intriguing to learn what went into building the limos. The interesting thing is that on my ’74 limo, i noticed the interior craftsmanship and refinement was better than a ’75 Sedan DeVille I had at the same time. Something as mundane or simple as a headliner in my limousine was much better finished off than in my DeVille. Also, when you shut any of the doors on the limo, they had a very solid “thunk” but on the DeVille, not so much. I realize some of that may be due to the fact that the Deville was a hardtop model and not nearly as solid as a sedan with a “B” pillar . 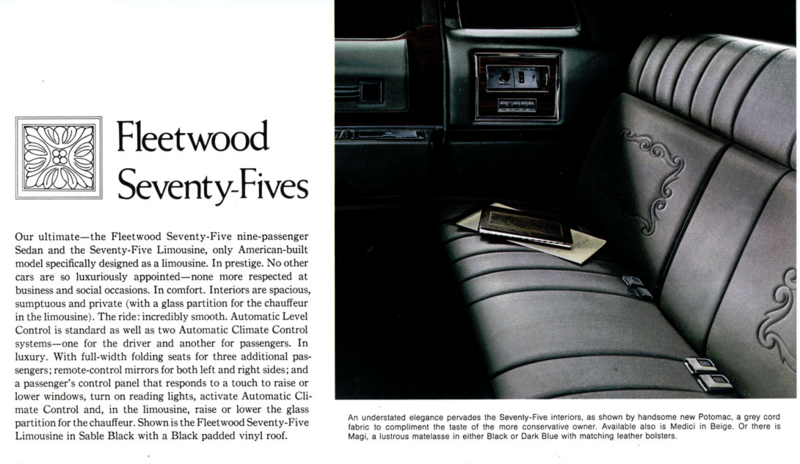 But the quality and craftsmanship was definitely first rate in the Fleetwood Seventy-Fives. Sort of a Cadillac among Cadillacs, then. Strangely, I can relate first-hand experiences with two of the factory limousines mentioned here. A friend’s car-collecting father has a strange interest in these machines and an eye for finding them cheap at live auctions or on eBay, and he has ended up with a 1969 Fleetwood 75 Limousine and a Chrysler K-Car limousine. The 1969 Limousine is a fascinating car to be a passenger in: all of that space completely changes your perception of the car. The cheap, hard plastic and fake wood interior fittings used in 1969 somehow seem irrelevant when you have so much legroom that you can lie down north-south on the floor without your head or feet touching anything, and the foldaway jump seats are amazingly well designed. It is impressively quiet and smooth-riding, of course. I can see why these cars were steadily bought by the small numbers of the really wealthy back in their day. Oh, and without a vinyl roof to trap water and cause rust, they can survive quite well over the years. The K-Car limousine, on the other hand, is utterly baffling. It is not spacious enough inside to make up for its K-Car mechanicals and interior cheapness. I cannot understand how the concept made it past the most basic testing (someone sitting in it) back when they were under development. 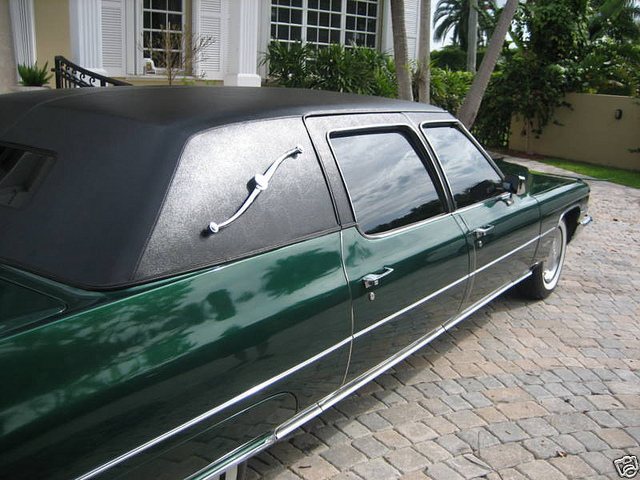 Supposidly, Lee Iacocca had an Imperial converted to a limo as a gift to Frank Sinatra. Most of the two dozen or so Imperial limos that were made were done either by Russ Brown in Detroit or Andrew Hotton. ASC DID do several 30″ stretches of the Imperial. I suppose that is part of the reason why they did the K-car limos, every car manufacturer likes halo models none more than Iacocca. So in a way, it made sense. It was probably easier to do a conversion on the LeBaron than the Fifth Avenue even though the Fifth Avenue would have probably been more practical. The Executives were small, but very nice and well built. I always imagine that it started after Lido wanting a limo, but not wanting to be seen riding around in a Cadillac or a Lincoln. I lust after one of these from the beginings of production right up until Caddy switched to the FWD version. Even being a child of the 80s I still felt that the strech limos were too gimicky and silly. Interestingly the commecial chassis cars kept the 368V8 right up till the FWD models debued. I’m also smart enough to know that I would tire of owning one of these pretty quickly. Anybody got a curbweight for the 1973 above? I’d love to put the weight into perspective with how bloated our cars have become. A quick Google search yields answers in the range of 5700-6000 pounds. I would guess that small bumper sedans are the low end, while big bumper limos with divider glass would be the high end. That’s a lotta car. Yes; I had that in my notes and forgot; I guess I was too enthralled. Never ceases to amaze me how the biggest cars back then weigh no more than, say, a Suburban or big European SUV of today. If they built this monster today, it would weigh 7000 pounds! These cars might have been huge, but their structural rigidity was nothing to write home about. My uncle had a 1973 Sedan de Ville hard top and while it was one of the coolest cars I have ever experienced, rough roads were not its forte. Any kind of broken pavement would send it dancing and shuddering all over. It was best suited for straight highways at reasonable speeds. Modern cars are much stronger; they have extensive bracing both for the reduction of NVH but also to make the cars safer in crashes. After my parents divorced, my mom was seeing a doctor who drove a dark green ’75 Fleetwood. At first, of course, I didn’t want the guy around, but he won me over by giving me the keys to his Fleetwood on many occasions. He also had a mini-fridge inside that plugged into the cigarette lighter full of junk food and soda pop (a doctor!). Here I was at 16 and 17 years old driving this Fleetwood and gaining street cred with my high school friends. One of my friends drove his dad’s ’76 Olds 98 Regency with the 455. “My” ’75 Fleetwood had the 500. We raced them a couple of times – both drags were a draw. The 500 was underwhelming, especially with the first gen catcon, a second smaller muffler after the primary one (resonator), and an air cleaner silencer on the intake snorkel. But in 1982, 83, no one really paid attention to such nerdy stuff; it was all about the size, the bling, and the in your face presence. During college, I worked for a funeral home that had one of these – a black 71, much like the car in the link that Robert Kim cited, though it was the sedan with no divider window, and also no vinyl roof. By the time I drove it (1978) it had been through 7 years of all city driving. It was starting to rust in the lower fenders, and the old soft GM lacquer paint had a decidedly satin quality from the almost daily runs through the car wash. Particularly when warmed up, the car always sounded like it wouldn’t start – the first revolution of the engine sounded like the battery was about dead, but then the thing would catch and start. I would imagine that 7 years of funeral processions would make for some nasty carbon buildup. 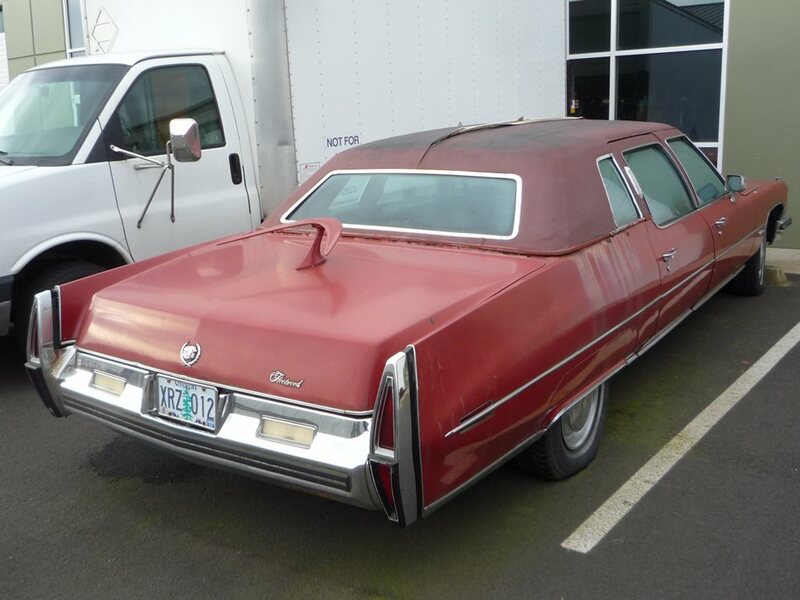 By the time I was there it had moved into backup duty, as the new limo was a 1977 Armbruster-Stageway 6 door Lincoln. The Caddy got replaced by another 6 door Lincoln in late 78 or early 79. Although the Cad was old and worn, it was a better driver than the Lincoln, which felt like an airport shuttle with really stiff suspension. The Cadillac at least drove like a regular Cadillac, only a little longer. It always sort of surprised me that Lincoln never offered one of these in its catalog in the 70s, as much as they were plainly gunning for Cadillac in those years. I always considered these very attractive. The black 71 with no vinyl roof was a beautiful car from most angles. I thought that Cadillac’s stylists got the proportions exactly right on these. I always thought these suffered from the restyles after 1972-73, and the 75-76 were my least favorites of this batch. The red color does this one no favors. Very interesting story, thanks for sharing. 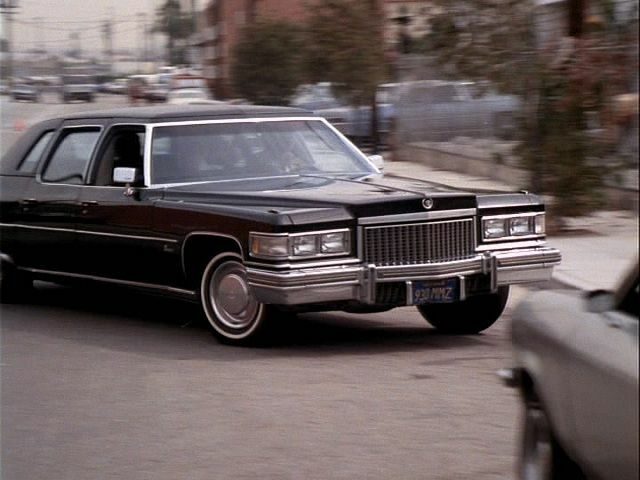 There was some sort of company that made a Lincoln limo conversion very similar to the Fleetwood 75, using a Town Coupe rear doors for the limo section, you can see it as Roy Wallys Limo at the end of Vacation. Think about the year this was built- 1973. Whoever bought this in May had a real headache in December, after the price of gas tripled. What would be the 0-60 time for this car? Bentley style “Adequate”? About 13-14 seconds and $20 in gas. These cars were not fast and speed is not what they were designed for. It was all about easy cruising down the Interstate and these cars excelled at this: 75 mph up or down any hill you could encounter. Zero to sixty times and g-forces meant nothing to the buyers of these cars. It was all about stately wafting and enough headroom for the beehive hairdo. Now-what really can you do with a beat up, big ole limo with the seats thrown in a pile in the back? Not much if you ask me, except park it next to a box van. Obviously it does run, judging by the air in the tires, so it’s clearly not abandoned. A car like this would be really cool if it was at least in decent shape, with all the parts in the right place. Some patina is definitely ok… Then you could tool around in it on the weekends or go to car shows. So frankly, I’m a little puzzled by this one. At least it has a set of matching whitewalls. Seen so many of these in beater condition tooling around in blackwalls or RWLs, which is Just. So. Wrong. I can’t figure out if the seats were removed to make the limo into a cargo carrier or if someone tore up the interior trying to find the source of the water leak. Unfortunately, once you see rust around the base of the top and rust streaks are going down from the C-pillar, the only way to fix it is to remove the vinyl top and fix all the rusty metal you will find underneath — and there will be plenty of it. The water always finds its way in there somehow. Even cars with tops that look good and even California cars can have HOLES in the roof underneath the vinyl. 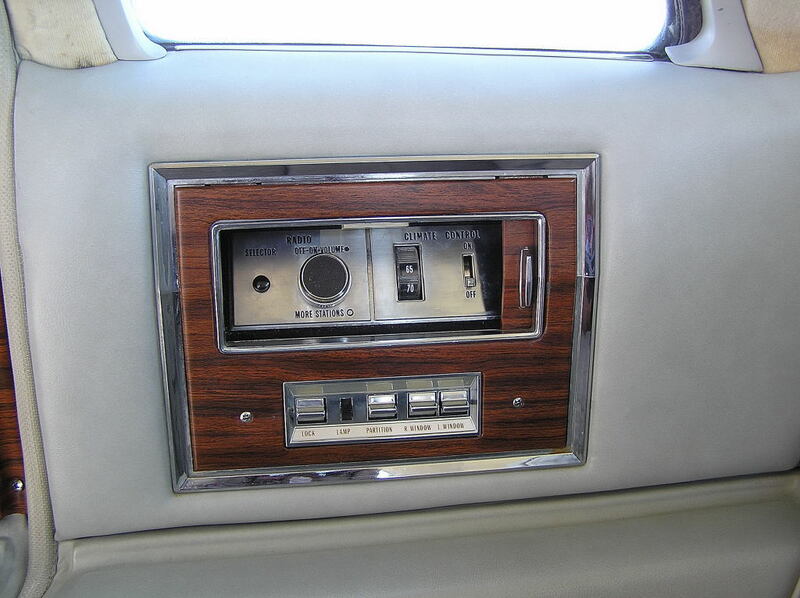 It’s an endemic problem with all 1971-76 GM full size cars with vinyl tops. The water leaks from the rear window leaks down behind the rear seat in all GM B and C bodies of the era. That would probably account for the removed seat and the stinkiness, especially in Eugene. Yep. The only reason my dad traded his in when it was just 3 years old was substantial rust bubbles around the edge of the vinyl top and the rear quarter panels. Then, the PS pump went out. All at under 50,000 miles. They were truly disposable cars. in the backseat footwells of this thing! One more thing – that shot with the stand-up hood ornament right over the Cadillac crest on the leading edge of the hood really irritates me. “Did you happen to notice that I have a CADILLAC?” Did Cadillac really offer this? After the stand-up hood ornaments came back on the 72 Lincolns, I remember seeing several Mark IIIs retrofitted with one, and also 71 Continentals, which had this same effect. It would not surprise me that Cadillac did a brisk business in these stand-up ornaments in the early 70s through the parts counters ad dealers all over the country. Yes. In fact, by the mid 70s there were 3 different styles you could choose from, I believe. I remember in 1975, my dad took his then 3 week old SDV back to the dealer to have them install a wreath and crest hood ornament. Being that I was only 7, everything he did was incredibly cool to me, so I, at least, was duly impressed. The Seville came standard with a smaller wreath and crest on its hood when it debuted in the spring of 1975 as an early 1976 model. Stand ups were not competely standard on deVilles/Fleetwoods until 1977. Even before this, all deVille and Calais models had a crest with a V while Broughams Eldorados and Sevilles used the wreath and crest. That continued until 1985 when all Cadillacs got wreath and crest ornaments (except Cimarron which only used a crest as an applique). As it is noted, adding the stand up wreath and crest was extremely popular, even today it was fairly common to have a stand up installed on a DHS and DTS model up to 2010 when only the deVilles had them standard. That is why you see cars with two, like this, because although the new ornament was added, often the header mounted one was not removed, which would have been the technically correct thing to do (and often was when a car was repainted). Being a Cadillac fan, I used to lust after these. I’ve never seen one in red, though. 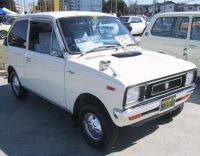 The 1977 downsizing was trimmer and more attractive, and the 1980-1984 models were also very attractive. If I remember correctly, in the mid-seventies there were two limousines offered: a Fleetwood Limousine and a Formal Limousine. 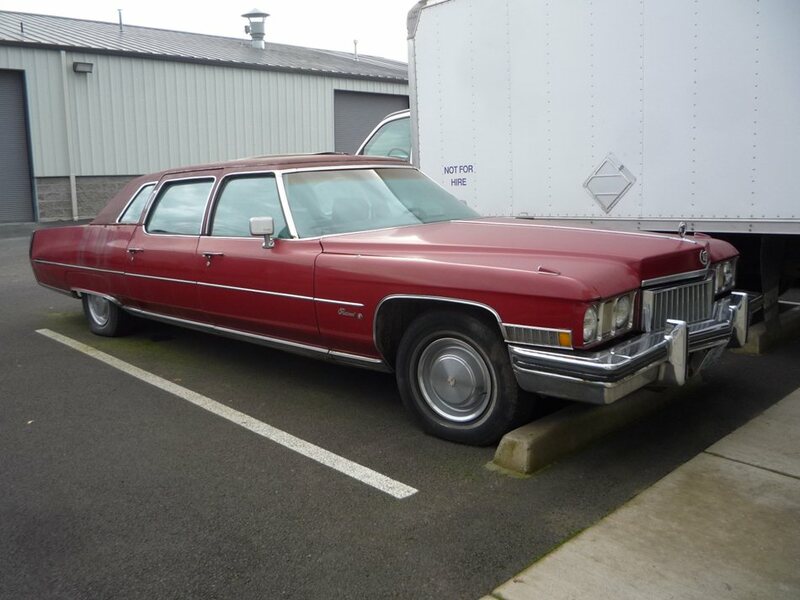 The latter had the rear quarter window covered over and a “brougham bar” on it. Does anyone remember “brougham bars”? 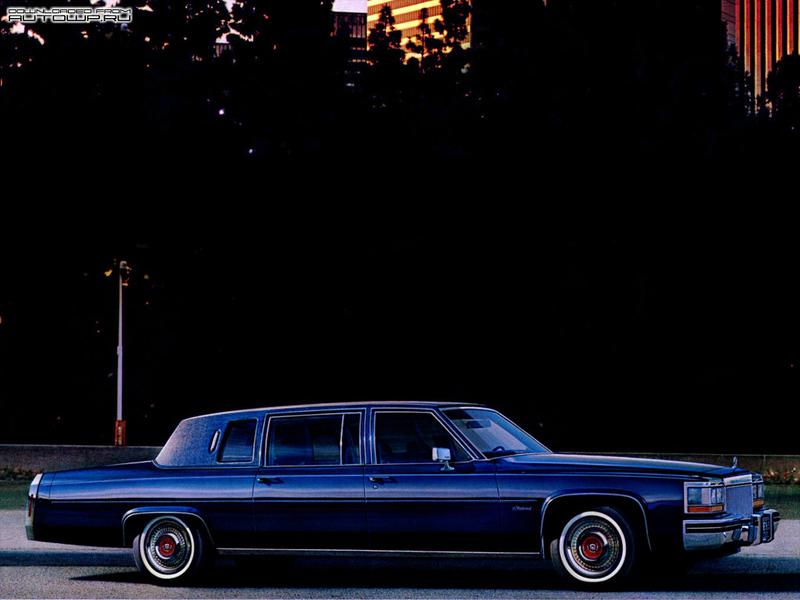 The 1980-1984 Cadillac Limousine didn’t make the story, but I thought it was a sharp car. And what was THE coolest thing about these cars? Why, the rear panel control, of course!! Let’s not forget individual ash trays and cigarette lighters. I really thought that was cool when I was a kid. These have ashtrays in the rear armrests and in the door panels, the Limo versions with the divider windows had additional neat limo only tricks, the rear windows could be lowered or raised through the rear controls, but ONLY raised throug the drivers controls, to keep the drivers from lowering the rear windows on the passenger without their control, same for power locks, also note that it has a keyhole for the rear passenger door, limos had a unique key for the rear door. 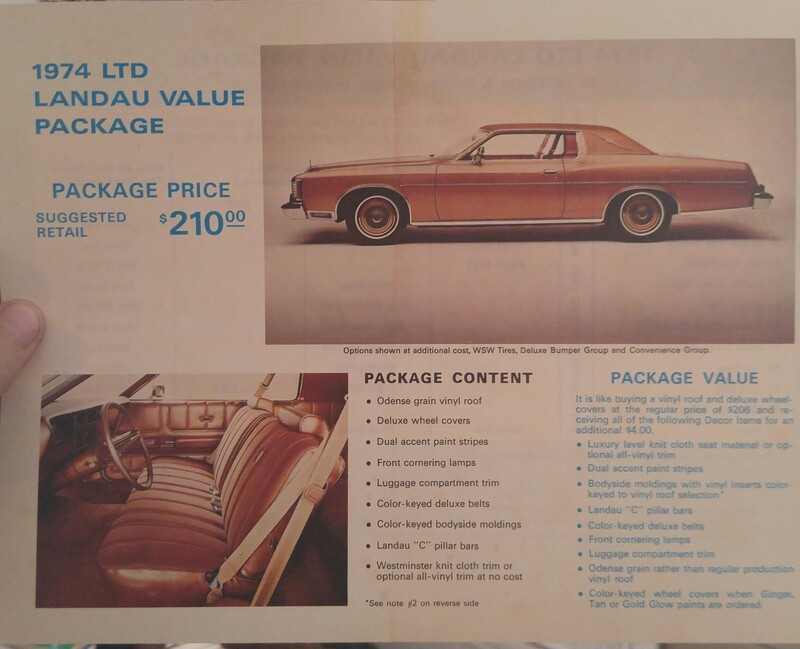 That was actually the “LANDAU ROOF” package and those things are called landau bars. Originally quite functional back in the 1920s and 1930s, but like so many things the functionality ceased but the gimmick stayed. The Series 75 was offered in two choices most years: a non-divided sedan that was basically just a stretched car inside, and a limousine sedan with a divider. The laundau roof package was optional on either version. 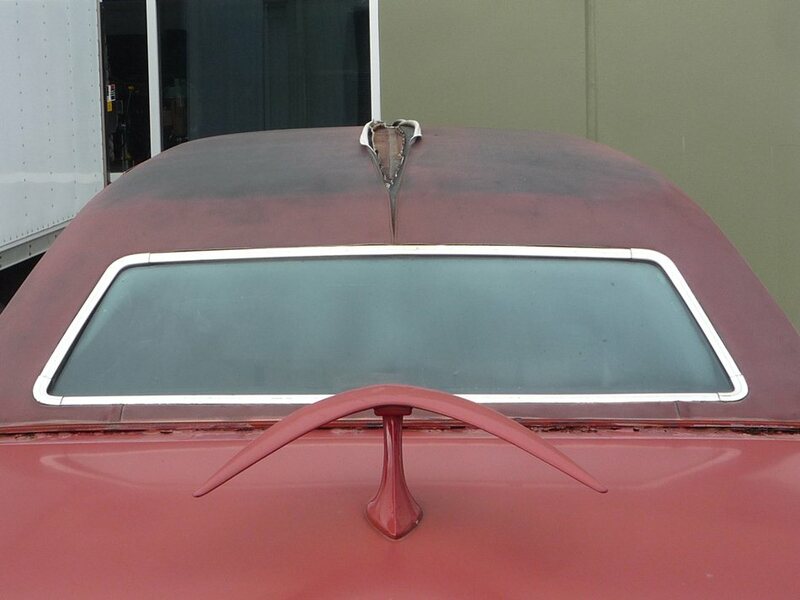 Technically, a vinyl roof was optional on Series 75 as it was on most Cadillacs, but few were delivered that way. The landau roof option you were able to get a normal sized rear window or a smaller window and delete the bars if you so choosed. Actually Ford started that mess on the T-Birds in the 1960s and especially with the 4-door T-Bird for 1967. Yes, that was a special order roof, you could get it with or without the landau bar, and the rear window was tiny, it was the max privacy package. I have one of these. they are called a landau limousine. they have the”blind” rear quarters on the roof with Landau irons.and a real small rear window. from what i have read, this was a $4,000 option and only around 20-25 a year were built.mine is a 1973 and looks just like the one in the pic.my car also has the flamboyant medici interior in tan. by the way, does anybody know how to take the rear radio out? They’re called landau irons or landau bows. The two models were the Seventy-Five Sedan (no interior partition) and the Seventy-Five Limousine. Either one could be ordered with the landau roof option, with the rear quarter windows blocked in. Without landau bows, it was a $1,973 option in 1972. With laundau bows, it cost $2,076. to describe certain parts of cars. Even Ford offered Landau Bars..on the 74 LTD Brougham. There were actually two vinyl versions. One with the rear passenger fixed window. The other as pictured is a Landau with ” brougham bar.” When you say “formal” that refers to divider window ( formal ) or no divider informal. If I remember correctly the window division model was referred to as the Fleetwood Seventy Five Limousine and the non divider was referred to as the Fleetwood Seventy Five Sedan. 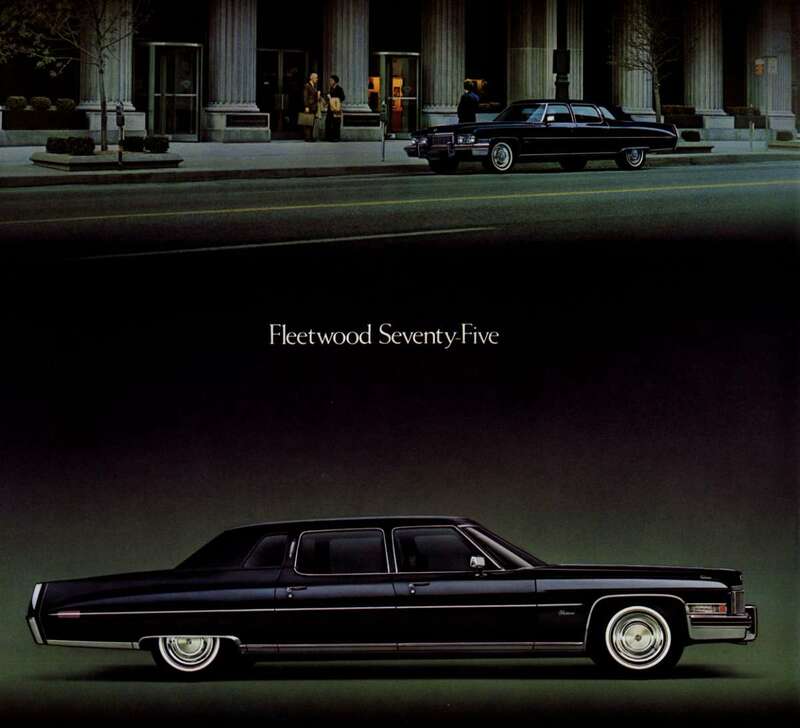 There were Fleetwood Seventy-Five Limousines ( window division cars ) and Fleetwood Seventy-Five Sedans ( non-divider cars – read ad above with picture of rear seating area that begins “Our Ultimate…..” ). The vinyl roof treatment you refer to is called a Landau roof (used in other cars as well). Some refer to it as blind quarters. I am unsure the Landau treatment was completed at the Cadillac Fleetwood Seventy-Five factories but suspect it was outsourced like some of the custom grills. I think they refer to those as Landau Bars. I personally own a 1976 Cadillac Fleetwood Seventy-Five Formal Limousine ( window division ). Hope this helps. I started with Cadillac back when these cars were still plying the roads. Part of the reason why they sold so few was that (aside from the cost and a small market) was that they were kept far longer than the average car. 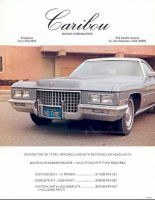 Driver owners would trade their Cadillacs back in the day every 3 years or so but these cars were generally kept in executive fleet service for 5-10 years. So it was not uncommon to see these 70s barges in the shop during the 1980s. The hood ornament was added. 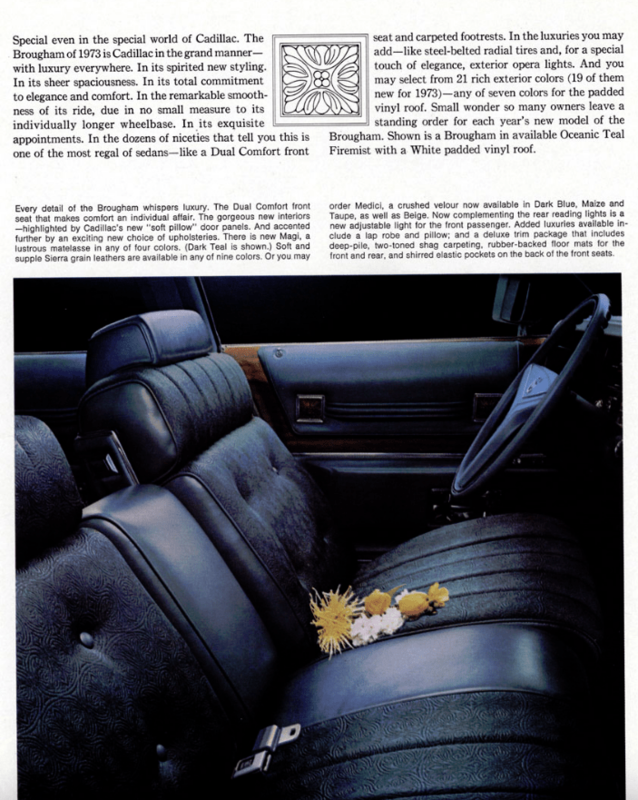 The stand up hood ornament was not officially standard on the Brougham until 1977, as you can see this car sports a header mounted wreath and crest as well as the stand up. The 1971 Eldorado was the first Cadillac with a factory stand up hood ornament and it became fashionable to add them to all cars. Originally, a crest only ornament was used to denote the lesser models while the senior models got wreath and crest. That practice ended in 1985 when all cars got a wreath and crest. Of course prom stretchs as we known them now did not come into the market until the mid 1980s, so if you wanted a limousine, you bought a Cadillac. Imperial made a factory stretch for a while called the Ghia until the mid 1960s but sold so few of them they did not affect the market. I am not aware of Ford producing a factory stretch at any point other than the L Town Car sedans of recent years. 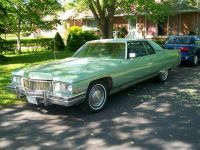 The 75s were manufactured in the same plant at Clark Street in Detroit that almost all senior Cadillacs were assembled until it closed in December of 1987. I never researched the details of how different the production process was compared to the standard cars, but given the VIN differentials they have to have been built throughout the year. An interesting note, prior to 1977 they were built off of four door cars but in 1977 started being built off two door cars as you can see from the pics above. Some of this had to do with cost control as they had to just simply cut and stretch a two door in the middle rather than custom fabricating a whole quarter as they did with other models. People have asked why Cadillac did not continue to build the limo on the D chassis as they continued production of the Brougham at Clark Street until 1987. Well that mostly had to due with the powertrain – the 368 V-6-4 (carbs on the chassis cars) was used on the stretches through 1984 but that engine was discontinued when the C bodies were downsized. The remaining RWD D cars still used the longitudinal 4.1V8 along with the Eldorado and Seville. Once the Eldo/Sevilles were downsized for 1986, the longitudinal 4.1V8 was dropped and the D cars picked up the Olds 307 which by that time had plenty of capacity as the big Olds’ had been downsized as well. No one expected the big D cars to linger on as long as they did so the decision was made to go FWD. Since I am a member and judge of the Cadillac club and AACA, I see handfuls of these periodically. Most of the ones are the older ones, pre 1971. I did have a customer for a long time that owned a private airport on a small lake in South Carolina that had a 1974 version that he used to transport passengers who would land at the airport. 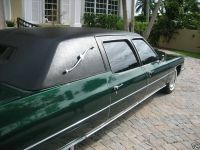 A local funeral home had a 1987 FWD Limo that we drove at the shop for a while when their parlor had a fire coincidentally when the car was in the shop and we agreed to store it out back for a couple of months until they rebuilt the home. I was never sure what to make of the Chrysler Executive cars either. They only made about 2,000 or so of them for a couple of years but unlike the Cadillacs, were done by an outside vendor under contract. I have seen them now and then at Chrysler oriented car shows and many years ago the manager of our local concert hall had one for ferrying duty. Of course, this was before all of the aftermarket companies got into the act big time and now we see stretches of Hummers, 300Cs, and other vehicles that defy common sense. Here below is perhaps an unusual stretch from the 81-83 Imperials. Did they still use the V8-6-4 cylinder de-activation system right up until the switchover to FWD, or was it just the regular 368? I seem to remember reading somewhere that both were available on the “Commercial Chassis” cars (in fact I think this is what it says in the Standard Catalog) – and I also know that GM was still issuing software updates for the V8-6-4 EEPROM for many years afterwards. And if it was still around, were they at all reliable – at least compared to the one-year-only passenger car version? 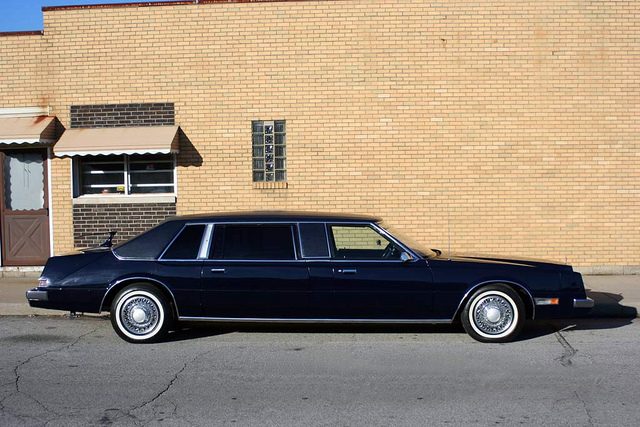 I’m not sure if I’ve ever seen an ’81-’85 factory limo, only the earlier ones like the example pictured here. I know I’ve never seen the FWD 75. As awkward as those look, I think it was a nice idea on Cadillac’s part to keep that tradition alive. I’ve never seen the Chrysler Executive limo either (or the even rarer short wheelbase Executive), which I appreciate for the sheer ridiculousness of it. Their last model year the Mitsubishi four was replaced with Chrysler’s own Turbo I powerplant – in all likelihood the only factory-built turbocharged limo that will ever exist. I’ve noticed one of the latest limo trends is using the Mercedes Sprinter vans, which seems pretty practical. At my high school prom the limo company messed up and sent us a 32 passenger Lincoln Navigator. We had ordered the cheapest Town Car available – there were only 6 of us! nose, center section and stern. I feel I should defend the honor of my 235″-long Imperial from this “regular production” custom job. Alas! I got nuthin’. Enhancing the apparent length of these Caddies, including the standard De Villes, is that their flanks are quite low. The top edge of the Imp’s front fender seems to be about a foot higher than the same part of this car. The ghost of KT Keller must have been pleased. Could it possibly be larger than this tuna boat? Yes, that looks like a 63 and was 213.3″ long. The 73 featured in the article was 250″ long making it 36.7″ over 3 feet longer than the Continental. Those Continentals were not as large as most big cars back then. True. More specifically, the convertible top on my 1962 Lincoln was actually a few inches shorter than that on my 1958 Plymouth. Neither were the mid-60s “full”sized Mopars. other options include a “Lap Robe and Pillow ” ? Is that literally a blanket that may also be used at football games to warm the legs, while bearing the Cadillac crest? I don’t recall the lap robe and pillow option. I Loved these cars as a child… They meant made it and not worried about losing it. As for who would order this in Red, My thoughts went To That Bagwhaun Buddist guy, Who IIRC had an Oregon property, and a penchant for Rolls Royce. Perhaps Jerry Lewis, or someone like Alice Cooper or Bette Midler who had made it big that very year. They were actually options. 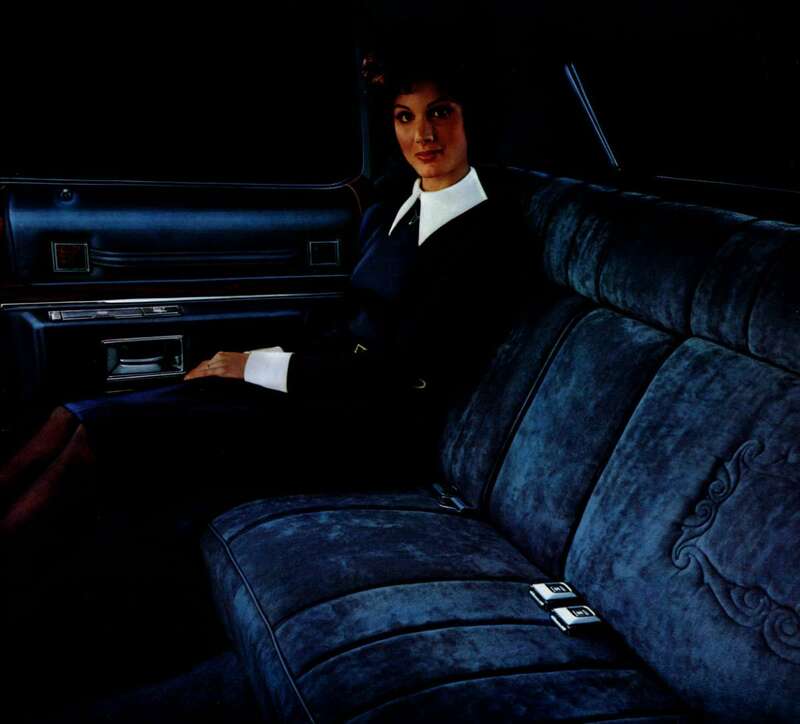 In 1975, for a brief few months, the front armrest in Cadillacs were replaced by a removable pillow, ostensibly so a driver or passenger could use it in other places. But it functioned poorly as an armrest and people had trouble keeping them in place and even lost them. That was back when a Cadillac was sold as an “experience” and not just as a different kind of car. The weird cylindrical pillow armrest (the “submarine”) in 1975 was only for cars with the 50/50 split bench front seats. Which eventually got individual armrests for driver and passenger. The lap robe and pillow were just that, and they matched the upholstery of the car too! I dont think they had a Cadillac emblem on them. Finding odd upholstery fabrics from the past can be done My friend with the Rambler SST found the correct gold brocade for his car online and cheap so he now has redone seats. From a fiduciary perspective I suppose the best reason Cadillac had for taking the trouble to build limos in-house, apart from transportation for VPs & Board members, is as a “halo” model for their sedans, a symbol of ultimate success for their customers. BTW, few tract-home garages are long enough for this car, another sign of exclusivity. I recall seeing a ’59 limo sitting out in a scrapyard circa 1976, missing its wheels, but looking impressive and intact. Around the same time, our local scrappie was dismantling a ’69 hearse with about 40k original miles. 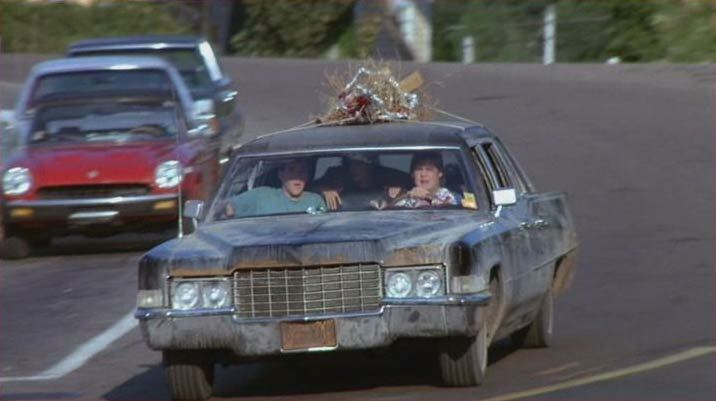 Although 7 years old, nobody wanted a used hearse, with the possible exception of Neil Young and a few motorcycle gangs. I’m glad that there are people like Walt McCall and his professional car breatheren to keep some of these vehicles going, as they are not for the faint hearted if needing restoration. My ’73 CDV can just fit in the garage with a few inches to spare, but this one would require some surgery with a sawzall to fit! Very nice. What’s the name of that green? I love green cars. That’s Exorcist Projectile Vomit Green. I love the shape of the ’71-’73 Cadillac, and being a ’73 model myself, I’d have to say the featured ’73 Fleetwoood is perfection itself! I saw a Fleetwood 75 in a slightly darker shade of red in an Australian magazine a few years back, and thought the colour was fantastic – so I like the colour of the feature car a lot too. Love this car. Great find. Never seen a 75 in Red and it looks like a factory firemist color. I’d love to ride in one of these behemots! I’ve never seen one in person, only in mags and internet sites. This looks cool in red color, and sure, it was a sight to behold when new! I could see using it as a mobile brothel. I agree with CVCavanough, the dark red does this car absolutely NO favors. And the vinyl top???…ew. And a ’73? No way. ’71s or ’72s, like anything, way better. For Caddys personally I wouldn’t buy one newer than a 1970. My first car at 14 years old was a rusty ’58 Sedan DeVille, had a ’59 rag top (REALLY rusty), a ’61 Series 62 Short-Deck 6-Window, a ’61 lavender 60-Series Fleetwood, a ’63 Hess & Isenhardt/Sayers & Scoville 3-way Landau hearse, and a ’65 Coupe DeVille w/a 472 transplant. 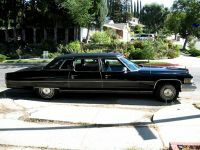 I own a black 1966 Cadillac Fleetwoood 75 limo with the full divider. It is from a southern state so the body is perfect. The problem with these cars is the vinyl tops. My car does not have one and the body and interior are fine. It’s not just Cadillac that had these issues. I have owned and worked on many cars over the years. Lincolns, Buicks, even Trans Ams, (saw one with this problem on an episode of Fast and Loud), all have had the same problems. Plain and simple vinyl tops were just a plain bad idea no matter what way you cut it. To bad auto manufactures took to long to catch on. Many cars were seriously damaged by this stupid option. I own a 1976 Fleetwood Seventy-Five Limousine. A very elegant and special Cadillac. Mine has the rear compartment I like best… black with black medici crushed velour rear seat… very soft and comfortable. The front seat is black leather. The glass power-operated partition window does work; I leave it up almost all the time. Mine is #246 of 834 ’76 limousines built. Has vinyl top and I added landau bars. Mine has the standard separate front/rear climate control system and the optional rear radio controls. It also has cruise control, twilight sentinel and outside thermometer. Current miles on the odometer are 98,411. It is garaged. A very smooth ride! Runs well, too. Fuel mileage is 9-13 mpg. Wheelbase is 151.5″ and overall length is 252.2″. Weight is 5,980 lbs. 1. 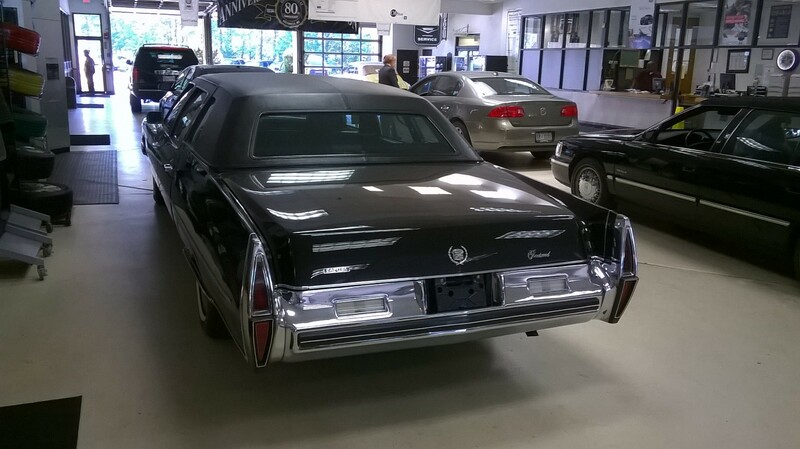 I find the ’75 Caddy factory built limo looked better than the current stretched limo. Perhaps because the location of the rear door? 2. Since the rear door is like 18″ ahead of the rear seats, would it be more difficult for the big bosses to get in and out? 3. It looked as if the rear “boss” seats were located ahead of the rear axle instead of on top of the rear axles like all sedans of modern era. Would seating ahead of the axle provide a better ride? It should, shouldn’t it? Since one wouldn’t be right on top of the bouncy stuff. I always thought the most comfy would be half way between the wheelbase. 1. Yes, I like when the rear doors are placed forward of the back seat. 2. Yes,it is a little harder to exit the rear compartment compared to the Fleetwood Brougham. But it’s worth it! 3. The ride in both the front and rear compartments is very smooth. A few friends have told me that the ride in the back is actually a little better than in the front. I can confirm this, too, after being driven a few times so I could ride in the back. 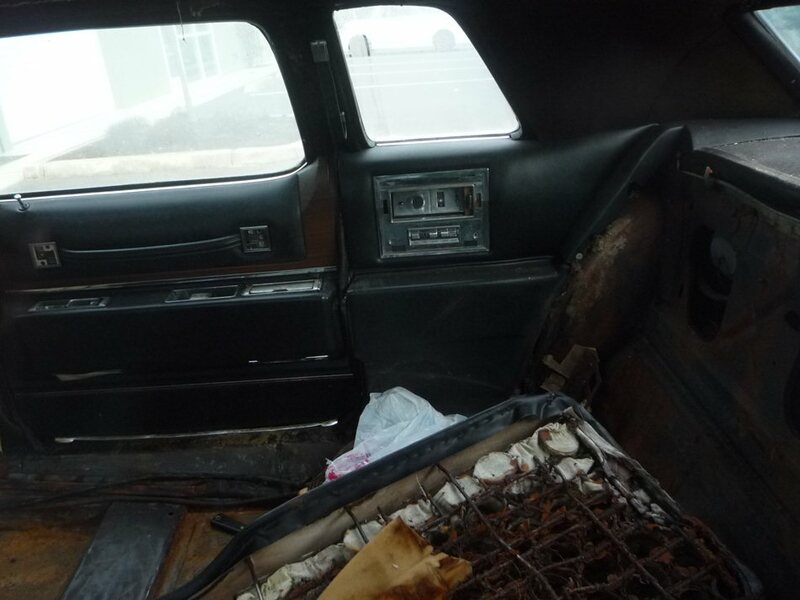 Here is a pic of the rear compartment of my ’76 limousine. You can make the case that the ’65 Lincoln Lehman-Petersen limousine was the Ur-stretch – definitely it was the first luxury limo to keep the rear door in place and handle the stretch behind the B-pillar. (Actually the Hess & Eisenhart ’61 Presidential parade car X-100 was the spiritual prototype.) Chrysler dropped the coupe-based Ghia limousine after ’65 and eventually went the stretch route from ’69-71 with Armbruster-Stageway conversions – essential a six-door airport limo stretch, without the middle doors. So props to Cadillac tor keeping a true limo on the market – at least until the 1985s. Rode in one of those around 1990 – sad, very sad. The bumper rusted off my 74 Eldo in two years. The dealership told me that’s a long time for these cars. I sold it and bought a Benz. I remembered these largest production limo back in the days. I am quite sure and would not be surprised if they are a bit more than 6000 pounds and if they were, this Cadillac Limo would surely weigh just as much as the typical fully loaded but much shorter 4×4 Chevrolet Suburban, Ford Excursion or even the heavy duty and defunct Hummer H1. If I remember correctly, in the opening scene of Oliver Stone’s “Nixon,” during a dark-of-night thunderstorm, a black Fleetwood 75 limo (I think a ’73) pulls up to the gate. With rain and thunder all about, the Marine guard approaches the rear passenger window, which rolls down to reveal White House Chief-of-Staff Alexander Haig (Powers Booth). The car then proceeds in as if approaching Dracula’s castle. Perfect car casting for ominous evil power. Sweet looking Cadillac. I’ve always liked Cadillacs of the late 60s into the mid 70s. Before World War Two the Series 75 Cadillac’s offered quite a few body styles, including 2 passenger coupes. After the war the market changed and the sedan/limo body was all that remained. Now that’s a limousine, not a caricature. Oh, I think it might (at 0:40, 2:55, etc). Shoddy. That one looks like a flower car. A which, now? What’s a flower car? 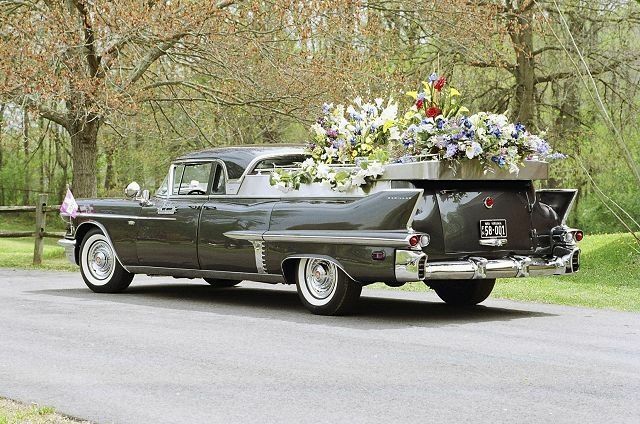 Pickup style used for funeral processions. The cabin of the illustrated Caribou model looks very short. Blank panels around the lights, visible screw heads – certainly looks disfigured. A limousine of the proper configuration with the rear seat sheltered for privacy have the door sets together. The disappearance of two door luxury cars to contribute the necessary quarter panels pretty much precluded continuing this build method for low volume production. Other than the current Rolls-Royce Phantoms, no one else is able to build this way any more, a shame. While practical, the cut-it-at-the-B-pillar-and-insert stretch really is the old six or eight door airport/coach-line configuration, offers little exclusiveness. Blame Lehmann & Petersen for starting this in luxury cars with the 1960’s Lincoln Continentals. Worse for the rear compartment passengers, everyone’s feet end up in the same foot wells, even if they can converse face to face. In the proper configuration, the folding jump seats were only for occasional use, allowed everyone to face forward. To assist the rear seat passengers egress, loop straps were mounted on the C-pillars to grip as stepping out. I remember those from the old Holdens. Always wondered what they were for. Immediately thought of the movie One Crazy Summer. Chilli Dog!!! I was curious how this compares to today’s “full size family cars,” the pickup truck. A 2016 F150 Supercab with an 8′ box is also 250″. With a Crewcab and 6.5′ box (an 8′ box is not available with the Crewcab) it is 243″. If you really want to stretch out, a Ford Heavy Duty (F250/350/450) can be had with a Crewcab and an 8′ box, at 263″. Maybe not a great comparison between a pickup and a Cadillac, but trucks have become both family cars and luxury cars. ’73 was a lousy year for those. Seriously underpowered due to smog regulations. Lean burn, EGR, way lower compression, catalytic converter… Fuel economy took a huge hit also. The rest of the car, not so bad but will it fit in the garage? Yes, but with 500 cubes under the hood, there was still enough grunt to move it down the road pretty nicely on low-grade unleaded. Haha, that line about fabric stores really hit home. My mom used to take me shopping for fabric as a sort of punishment. So yeah, they make me woozy too. Capital Cadillac in Greenbelt Maryland has a restored one. They have a 4 lane service lane and two of those lanes are dedicated to showing off their vintage Caddies. Here are a couple of pics of that Fleetwood they have. Sadly I forgot to take a pic of the side of it. Anyone remember how George Peppard made these cool by being ferried around in one in “Banachek”? 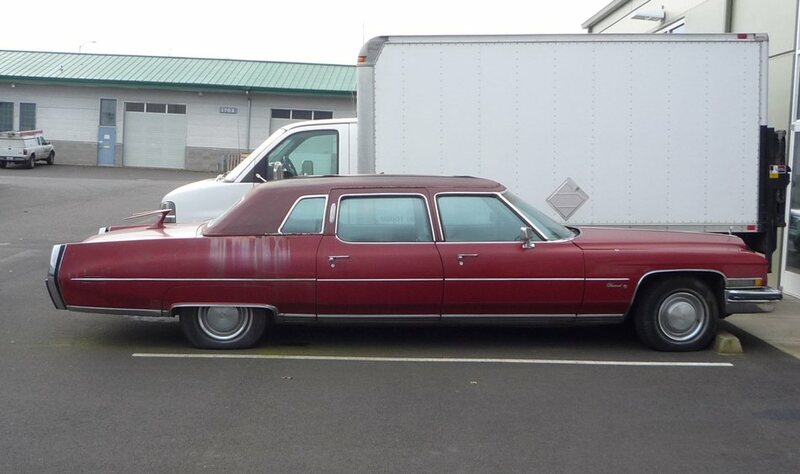 At its largest at 252″ which were produced between 1974-76, these Cadillac Limousine were even 16″ longer and still about 5x heavier than if you take two Mitsubishi Minicas since a Minica is approximately 117.9″ long bumper to bumper. 6000+ pounds for the 1974-76 Cadillac Limousine vs. 1000 pounds for the Mitsubishi Minica. the fleetwood 75 seriously needed 4 wheel steering. love the proper rear seat with privacy. 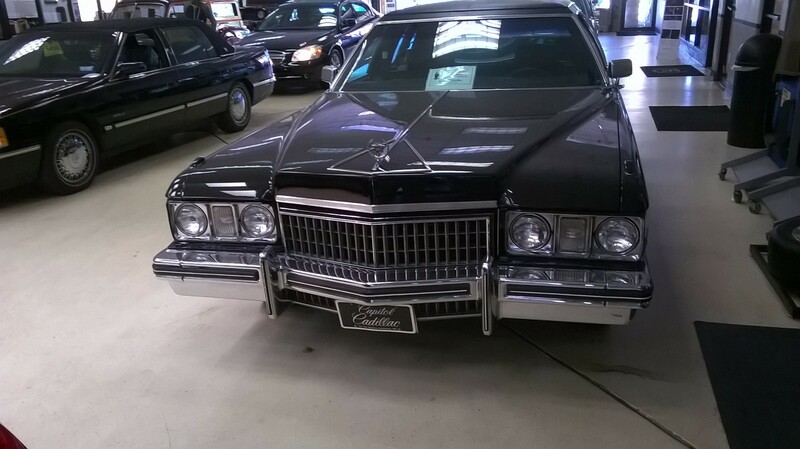 The 1973 Cadillac Fleetwood Limousine is my dream car for when I reach the age where I should no longer sit behind the wheel myself anymore. 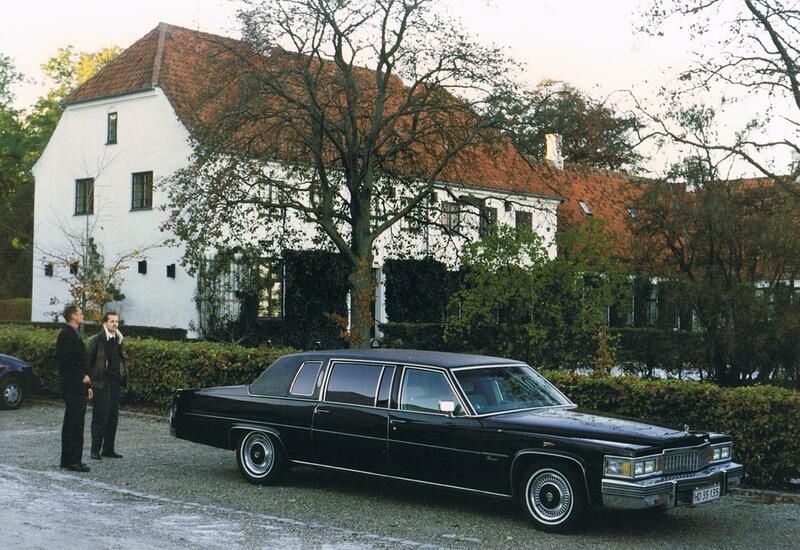 We had a 1978 Cadillac Fleetwood limousine for 5 years and enjoyed it very much. The 1973 long, slim and beautiful. 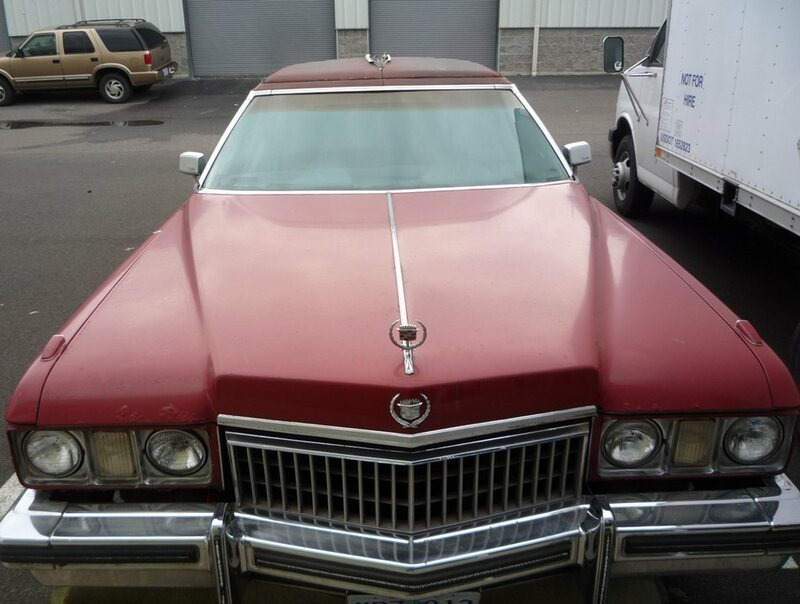 Had a 1973 Coupe de Ville for 9 years and drove over 60K miles in it. Great smooth ride. They are hard to find, but I am sure there are people who take good care of the last ones left.